I am not a big sock knitter. Apart from a few Christmas stockings, a couple of baby booties, this is my third pair. And I have to say, I really enjoyed making it. I had never been friends with DPNs, so I only really started looking at socks when I discovered magic loop. 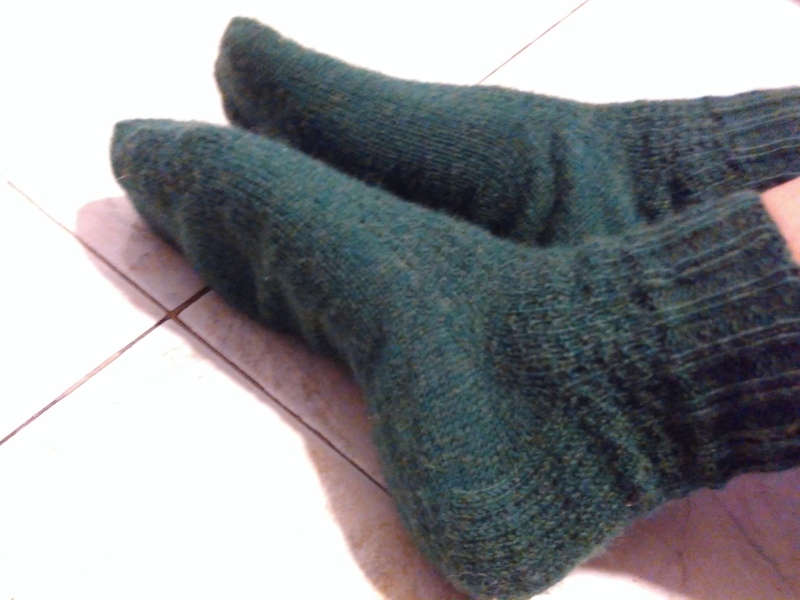 This time, I tried knitting them toe up two-at-a-time, and loved it. On one hand, I really enjoyed the fact that I could try them on as I went. Toe-up also meant I didn’t have to worry about the leg length and whether I will have enough yarn for the foot. On the other hand, I didn’t dare to try too many new things at the same time, so I stuck with the gusset heel. However, when you work toe up, there’s no need to pick up any stitches – YAY! – and there aren’t any problematic holes in the corners. All in all, it’s much easier and more enjoyable to work, and it looks better too! 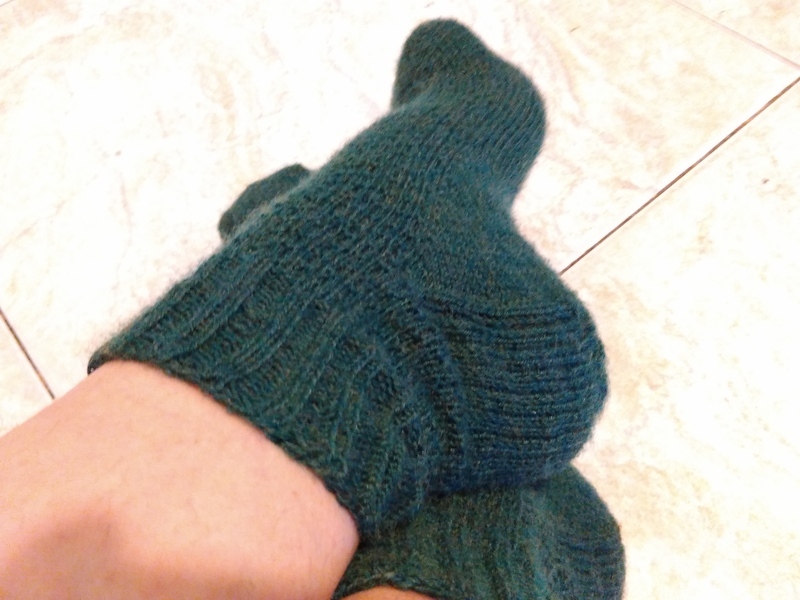 To make these, I have used lovely yarn “Socks Yeah!” – I really enjoyed working with it. While amazing quality and beatiful colour, it is not as expensive as top brands, so I hope to work with it again. 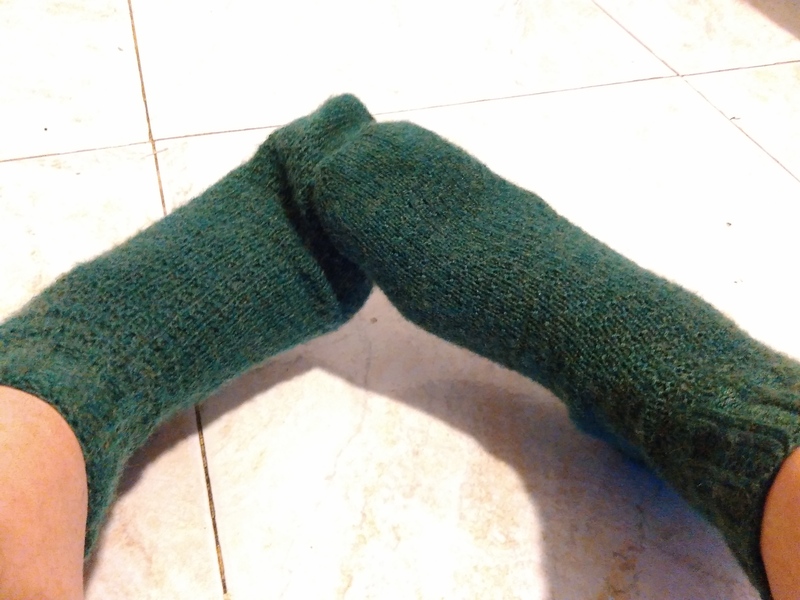 I like my socks quite short, so I only used up 60g for the pair, and plan to use the rest for fingerless mitts. 2 mm needles – I did not use a smaller size for the ribbing, and it still looks good. I combined two patters to make this beauty. Vanilla Sock with Gusset & Choice of Heel by Jo Torr guided me through the sock construction. I cast on however 40 stitches (20 on each needle) for each of the toes, making less increases – I think I prefer a blunter toe. I increased to 64, but I think I’ll try 60 next time, as the socks are quite a loose fit. The heel started at 14.5 cm from the toe, but I think again, 14cm would have been enough. Used the heel stitch for the heel, and the twisted rib at the top. I see Jo has also got a toe up basic pattern for a short row heel – might try that next time. The stitch pattern comes from Hermione’s Everyday Socks by Erica Lueder – just what I like simple and stylish! Separator image Posted in My kniting & crochet and tagged with hermionessocks, instaknit, knitlove, knitstagram, knitted socks, knittersofinstagram, knitting, knittingmakesmehapy, knittingsocks, leylawp, nevernotknitting, pleteni, socks, socksyeah, stricken, toe-up socks, tricot, носкиспицами.